This very beautiful and mysterious narrative has always suggested a mystical appearance of the Holy Trinity in the Christian tradition, and countless icons have taken their inspiration from it. Certainly there is an intriguing interplay of one and three in the text. 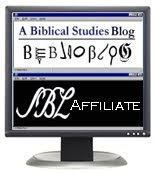 The text says, “The LORD appeared to Abraham,” in the singular; but three men show up. When Abraham greets the men in Hebrew, he begins by addressing them in the second person singular (“you”) and then switches to second person plural (“y’all”). So are they one or three? Yes! The context of this meal is important. In the immediately preceding textual unit (Genesis 17) God had re-made his covenant with Abraham (first made in Genesis 15), introducing some revised terms, such as circumcision as the mark of the covenant. God also incorporates the promise of kingship as a term of the covenant, and specifies that the son of Sarah—Abraham’s first-and-should-have-been-only wife—will be the heir of the covenant. Now, in our present chapter, the LORD shows up to have a meal with Abraham. Meals are important covenant rituals. Covenants form unrelated persons into family members. Families eat together. It is a sign of communion and relationship. Having formed a covenant with Abraham, the LORD now appears to share a family meal with him. In this meal, Abraham is eager to serve the LORD and feed “them” well. He wants to be a good host. But this meal is not about what Abraham can do for the LORD. 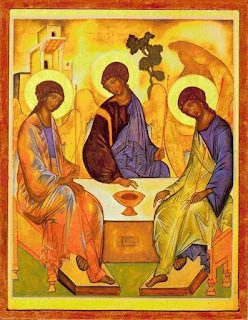 Do we really think these three angelic visitors needed material food? Instead, this meal is about what the LORD can do for Abraham: provide him a son and heir, in fulfillment of his covenant promises. Since the First Reading and Gospel are both about sharing intimate communion with God (in fact, sharing a meal with God), the Psalm reminds us of what sort of persons we need to be to have this privilege of “living in the presence of the LORD.” To live in the presence of the LORD requires that we do justice, think the truth, refrain from slander, from harm, and criticism of others, from usury and bribes. It requires that we encourage those who honor the LORD and refrain from honoring atheists and those who mock faith in God (“the reprobate”). These “rules” are not meant as a restraint on our lifestyle, but as a path to happiness. Can the man truly be happy who commits injustice to others; believes in falsehoods; slanders, harms, and criticizes those around him; charges unfair interest and takes bribes; who mocks and humiliates those who worship God, and encourages blasphemers and atheists? Can that person be joyful and content? Even if he is successful for a while in avoiding retaliation from all those he has harmed, I submit that man cannot be happy because he cannot have interior peace. The practice of evil is its own punishment. [This could be misinterpreted as teaching] that the passion of Christ was not sufficient for our redemption, and that the sufferings of the saints were added to complete it …. But this is heretical, because the blood of Christ is sufficient to redeem many worlds…. Rather, we should understand that Christ and the Church are one mystical person, whose head is Christ, and show body is all the just, for every just person is a member of this head: “individually members” (1 Cor. 12:27)…. We could say that Paul was completing the sufferings that were lacking in his own flesh. For what was lacking was that, just as Christ had suffered in his own body, so he should also suffer in Paul, his member, and in similar ways in others. [Thomas Aquinas, Commentary on Colossians (trans. F. R. Larcher; Naples: Sapientia, 2006)]. This is one of the places in Scripture that teach us the doctrine of redemptive suffering, that as Christians we will and indeed must suffer in this life, but our sufferings are participations in the suffering of Jesus, and as such have value in God’s eyes and advance the salvation of the whole world. The truth of redemptive suffering is lost in Christian groups that teach “salvation by faith alone” understood as a path to heaven that involves believing, but not necessarily a transformation of one’s thought and behavior, much less the endurance of suffering for Christ’s sake. This was the kind of Christianity I was partially raised in. Thankfully, however, on a practical level there was a greater recognition for the need to transform behavior than there was on a theoretical level. Sometimes one’s religion can be better than one’s theology. In this part of Luke, Jesus has begun his “death march” to Jerusalem, where he will celebrate the great familial meal par excellence that will form the New Covenant. On his way, he stops in the home of Mary and Martha to share a meal with them. Like Abraham, Martha and Mary have the opportunity to host God at a meal in their home. Martha and Mary have different attitudes toward Jesus in their home. Mary is concerned about what Jesus can give to her, and sits soaking up his teaching. Martha is concerned with what she can do for Jesus, and is busy about serving the food. But does a man who can multiply loaves to feed 5,000 really need someone to bring him food? Martha is not ill-intentioned, and Jesus treats her gently. “Martha, Martha …”—the repetition of her name is a sign of affection and love. He understands her mindset and knows that her desire to serve is ultimately also an expression of love for him, even if misguided. What is the “one thing”? Some suggest Martha was serving an elaborate meal and Jesus is suggesting a single dish would have sufficed. Perhaps that is true. But Scripture has layers of meaning. On a deeper level, the “one thing” that is necessary is communion with God. Finally, this is the only thing that matters, and it is all we will do and enjoy in eternity. Martha’s great business causes her to lose communion with Jesus. So busy serving, she is not spending any time with him. There is a pleasing illustration of Martha’s attitude in an excellent German film marketed in the US under the title “Mostly Martha.” The lead character—not accidentally named Martha—is a German cook obsessed with perfection, who has forgotten that food and eating are ultimately forms of communion with other persons, an expression of love and fellowship. In the course of the film—and through much pain—she learns to open herself to a communion of love with her young niece and a fellow chef who becomes her husband. She comes to understand meals not simply as a chance for her to display artistic and scientific prowess, but as opportunity for the communion of persons. The whole movie is very much applicable to the themes of this Sunday’s Readings. But back to the Gospel reading: Martha’s problem is that she is too concerned about what she can do for Jesus, when it is really about what Jesus can do for her. Mary seems to understand this, as she sits at Jesus’ feet. About Mary, we can apply a pleasing interpretation of an important Old Testament text. After the Sinai Covenant was solemnized in Exod 24:1-8, the leaders of Israel went up on Mt. Sinai, and they shared a meal with God: “They beheld God, and ate and drank” (Ex 24:11). Some ancient Rabbis took this to mean, “They looked at God and in this way they ate and drank.” In other words, the Beatific Vision was their sustenance. We can apply this verse to Mary: while Martha tries to prepare a physical meal, Mary beholds Jesus and that is sustenance enough for her. We can meditate on this concept in Eucharistic Adoration. This Sunday, we hear these words proclaimed at the Mass, our own covenant meal with God present. Yet we need to remember, the Mass is not something we do for God, nor is it a meal we host for God. The Mass is something God does for us; He is the host of the meal. We don’t do God a favor by showing up for Church on Sunday and throwing something into the plate. This does nothing for God. It does not enhance his dignity or add anything to his power or glory. God does us a favor by hosting a meal for us every Sunday in which he offers Himself to us as food, in the most intimate act of communion with Himself imaginable. Mass is not about what we do for God, but about what God does for us. At this Sunday’s Mass, let’s pray more intensely for God to work in our hearts, to forgive our sin and transform the way we think and act, that we can become like the man of Psalm 15 who is suitable to dwell in God’s presence; or like Mary, who understood the “one thing” necessary and was willing to say “No” to distractions and demands in order to soak in the presence and teaching of Jesus.